Believe it or not, most of your prospects and customers think you’re a robot, and it is negatively impacting your business. The proliferation of mass email through automation is actually designed to make you more efficient and productive, but has also made you less personal and trustworthy. People now receive more emails than ever and are quick to hit the delete button if the email is not personal and catered to them. According to a survey from About.com, 84 percent of customers say companies must first prove that they are trustworthy before giving them their business. Sending generic, text based emails — like a robot — is far from personal and will certainly not generate the trust necessary to close more deals. Put yourself in their shoes. How many emails do you get from reps trying to sell you something, or from a customer success manager who’s coaching you on how to use their product more effectively? These emails typically consist of exhaustive paragraphs or outdated attachments that nobody reads. And how apparent is it that the exact same email you have received was also sent to thousands of others? Prove to your customers that you’re human by recording a simple and effective video message for them. Be sure to introduce yourself, address them by their name, and convince them you know a thing or two about their current challenges by identifying the pain you’re trying to solve. The more personal your message is, the more likely they are to trust you and respond to you. And at the end of your message, make sure you have a specific call to action so the recipient is clear about next steps. Sales and Customer Success is largely about trust. Short video messages to your prospects and customers will go a long way in developing the trust needed to close new deals and renewals. With OneMob, you can record and send personal, branded and trackable videos, and it’s fully integrated with Salesforce. 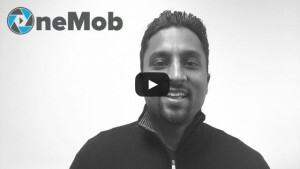 Record a video within 45 seconds from your iOS device or desktop webcam, then send it to your Leads and Contacts in one of three ways: directly from OneMob, from Salesforce, or from your own email client (e.g., Outlook, Google Apps). OneMob customers have seen up to a 10X increase in response rates just through this personal touch. Try it out! We can’t believe it’s been a whole year! Seriously, where has the time gone? The past year has been full of twists and turns, but never a dull moment. We’re so grateful to build a team and company like OneMob and want to thank all our employees (and their families), customers, investors, advisors, prospects and friends for your support and guidance. We’re better because of you! Moved into our new office (480 2nd St. Suite 203, San Francisco, CA) – stop by and say hi! And we’re just getting started. Onwards and upwards! As the weather’s heating up, so are our offerings. Today, we’d like to introduce you to the new OneMob Web App. Let’s take a look at what’s new. Record From Your Web Cam: The wait is over! Now you can record personal, company-branded and trackable videos directly from your web cam. Upload and Track Existing Videos: But what about your existing videos? Now you can use the OneMob platform to send and track those too! Upload and send any video (e.g., demos, training videos, product announcements, etc.) so you can know who’s watching with real-time notifications and activity tracked in Salesforce. Send Videos From Anywhere: All your OneMob videos are now synced and can be sent from anywhere: the Web App, iOS mobile device and Salesforce. Personal and Team Dashboards: Easy to read charts and graphs give insight into your OneMob activity and how you’re measuring up with your team. See how many videos you’ve sent and trends in overall prospect/customer engagement like opens, plays and responses. Get the Web App by heading to onemob.com. Click Login and enter your usual Salesforce credentials. It’s pretty straightforward, but if you have any questions, check out the User Guide or contact us at support@onemob.com. Enjoy!